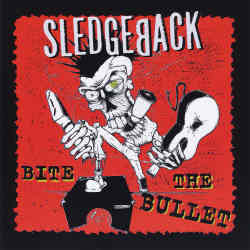 Sledgeback are an punk rock band from Seattle that was founded in 2004. Vocalist and main songwriter is Hungarian born Gabor Hun who used to play in C.A.F.B. back in Budapest. Bite The Bullet is the third longplayer of this band I have so far been unaware of. Inspired mostly by punk rock of the Eighties and Nineties, Sledgeback quote Social Distortion and Bad Religion as their major influences. The first impression could give a different image, as the opener Palinka – also recurring as a radio edit at the end of the CD – combines punk with rockabilly and even some Balkan influences. This track sounds quite raw, but afterwards the band travels some years into the future without ever reaching the present time. Next to the aforementioned influences, I also feel reminded of Hüsker Dü and Leatherface, both first class references. The raw voice is rather striking, making one wonder if the vocalist is suffering from throat cancer, but have just as much charm as the impeccable songwriting of the mostly rather fast paced material which is so simple and catchy at the same time that they just have to please. Only Don’t Look Down On Me could do with some more verve. The CD’s length of nearly forty minutes is also ideal as the band is avoiding to make a good thing last longer than it should. I don’t know how teenage punk kids will react to Bite The Bullet, but those who grew up in the Nineties will have a hell of a time with this pleasant retro trip. Sledgeback have manufactured a nicely uncomplicated album that is fun listening to again and again.